Friedrich von Amerling was an Austrian painter that, next to Ferdinand Georg Waldmüller, is considered as one of the best portrayers of his country. He traveled across many countries which allowed him to learn from several cultures and, since 1835, he became the official painter of the Austrian emperor Franz Josef I. He is the author of 1000 paintings, most of which are portraits. In The drowsy one scene, we can see two characters: a woman and her daughter. By their position, we can see that the mother was taking a nap (which I think because of the sunlight entering from the left), until her daughter, bored for being alone, tries to play with her mother with some kind of medal with a yellow ribbon. 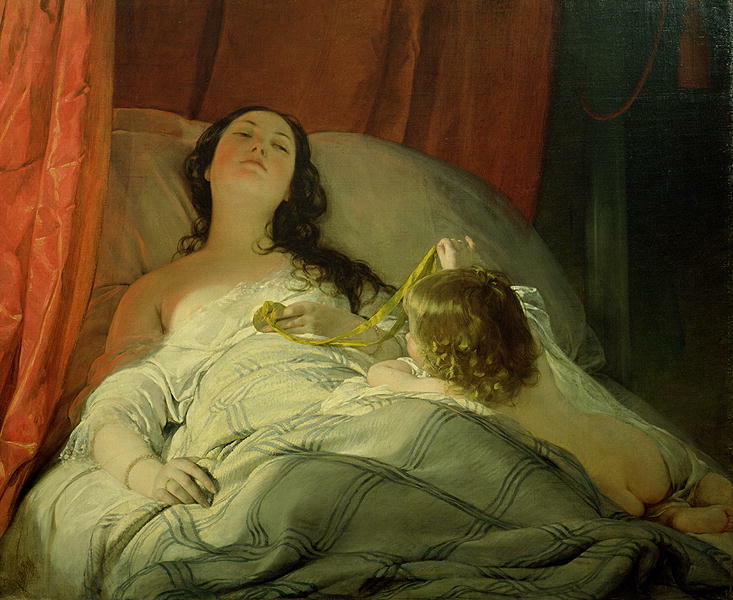 The instant of the painting illustrates the first time the mother opens her eyes trying to understand the situation. But the most outstanding characteristic of the work is the play of the sunlight, which lights different textures, from the white skin of the mother, to the golden curled hair of the daughter. Like this, the artist, with his talent, makes us feel the close relationship between a mother and her child; and turns an everyday situation in a magic scene. ~ by Álvaro Mazzino on January 6, 2011. I can’t believe that Amerling created over 1000 works, mostly portraits! How amazing! Thanks for this great blog and sharing The drowsy one! What do you think of his Portrait of Austrian Emperor Francis II? Following years of race-to-the-bottom pricing in China, the release of the iPhone 6 and iPhone 6 Plus — which introduced larger displays to Apple’s lineup — prompted an apparent shift in consumer habits that has seen the average selling price of a smartphone jump by nearly 40 percent in the Asian nation. This entry was posted on January 6, 2011 at 09:18 and is filed under Realism.You can follow any responses to this entry through the RSS 2.0 feed.You can leave a response, or trackback from your own site.